Things are getting cream cheesy and apple-y around here! And I LIKE IT. I hope you do, too. Few things are more necessary to the full fall experience than baking apple crisp (especially with handpicked apples from the orchard) — but why just go the traditional route when we can have mini cream cheese apple crisps, a.k.a. 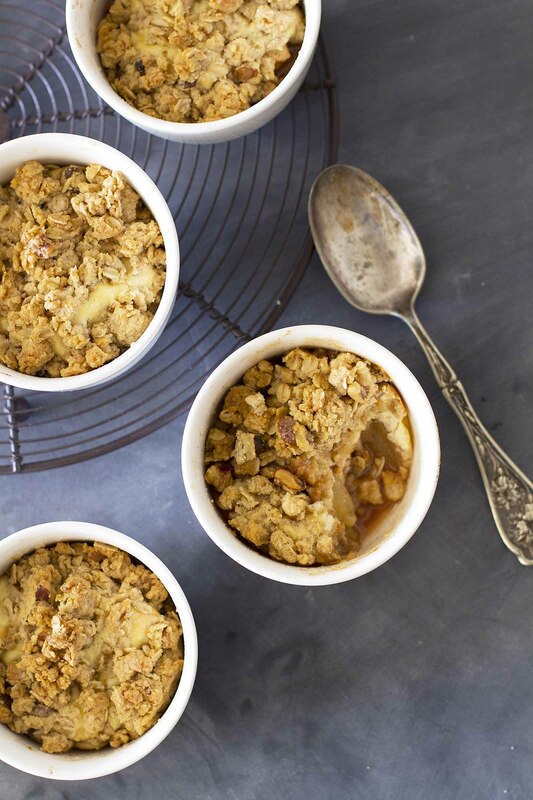 apple crisps with a delicious cheesecake-like topping, in individual bowls (that you can win, BTW! ), meaning you don’t have to share? I’ll take that scenario any day. Local modern home good purveyor AlwaysMod and I are partnering again to give away these sleek, minimalist, adorable Marimekko Oiva Dessert Bowls, much like we did before here and here. I honestly love all of AlwaysMod’s offerings, including these bowls that I’ve been using for everything from baking these mini crisps to holding the perfect amount of tomato soup in which to dunk my grilled cheese sandwiches (so basic, so autumn). Their simple design makes them fit into essentially every kitchen, and because they’re so versatile in both size (stackable, smaller than a cereal bowl but bigger than a ramekin) and use (oven-safe, microwave-safe, dishwasher-safe, freezer-safe, YAAAS), I know I’ll be calling on them for so many sweet and savory recipes for years to come. And at the end of this post, you have a chance to win a set of four of them for yourself! But before we get ahead of ourselves, let’s talk more about the cream cheese apple crisp situation. 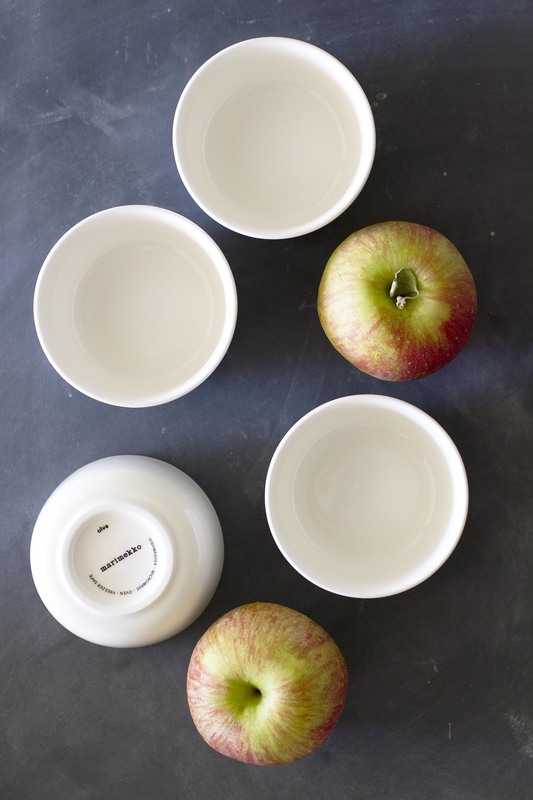 These bowls and the gorgeousness that is fall inspired me to make mini apple crisps, but I also randomly had a surplus of cream cheese in our fridge that needed using up. 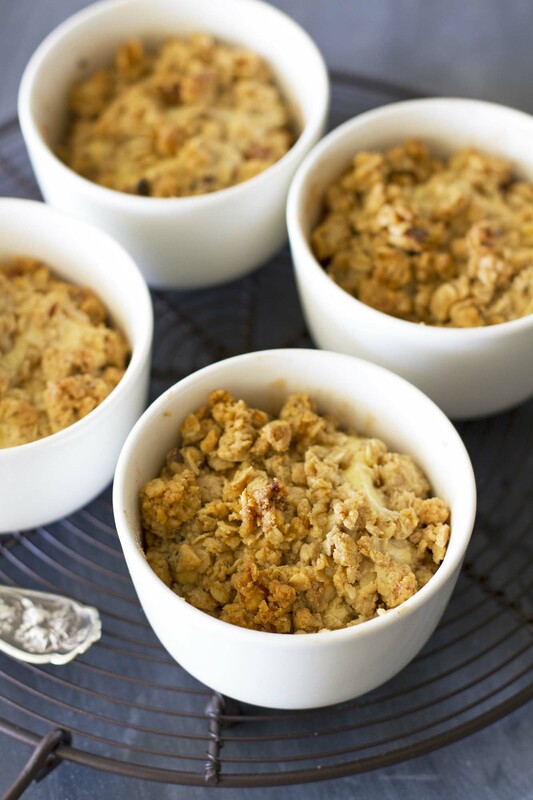 That’s when it hit me — combine them into a cheesecake-apple crisp, where the bottom is that classic sweet, gooey apple cinnamon mixture but the middle is a layer of creamy, cheesecake-like filling and the top is a crunchy, sweet crumble of oats and nuts and butter. And we can bake it in these bowls, making them mini/individual/I don’t need to share-size (which is great in this house, where I live with two mooches). If you add a scoop of vanilla ice cream on top while the crisp is still warm, you are my food soulmate. 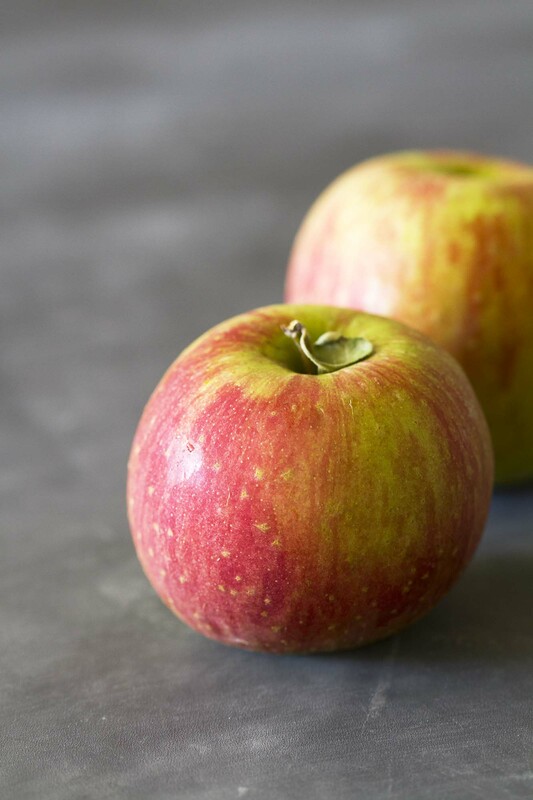 You can use just about any type of apple for this recipe, though I’m partial to the crunchy sweet-tart varieties like Haralsons, Honeycrisps or Pink Ladies. For the cream cheese mixture, make sure the cream cheese is completely room temperature before mixing it together so it’s smooth and creamy and not lumpy and… well, not creamy. And finally, if you don’t want to bake these into individual bowls or ramekins, you certainly can bake one big crisp in an 8-inch square pan if you want. Just be careful if you live with mooches. And now for the fun part (though I happen to think apple crisps are pretty fun, too) — the giveaway! TO ENTER THE GIVEAWAY, visit AlwaysMod and enter your e-mail address in the entry form on their site. Official giveaway rules are listed on AlwaysMod. Good luck! And happy apple crisp-ing. Heat oven to 350 degrees F. Spray inside of four 8-ounce oven-safe bowls or ramekins with cooking spray (or, spray 8-inch square pan for 1 big crisp). In large bowl, stir sliced apples, sugars, cinnamon, ginger and salt until well combined. Divide mixture evenly among prepared bowls. In separate medium bowl using electric hand mixer, beat cream cheese, egg and vanilla until smooth. Spoon mixture evenly on top of apple mixture in bowls. In separate medium bowl, use fingers or pastry blender to combine all topping ingredients until well mixed. Sprinkle mixture evenly among bowls. Place bowls on rimmed baking sheet or baking stone. Bake crisps 35 to 40 minutes until topping is golden brown and mixture begins to bubble around edges (NOTE: bake time may vary if using 8-inch pan). Cool slightly before serving. I could eat those right now. They look so delicious. Thank you so much. 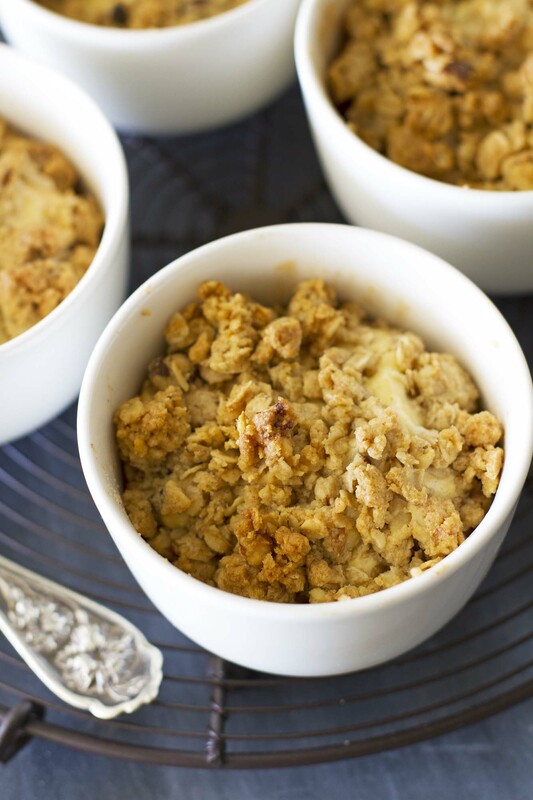 I love this version of Apple crisp and will bake in an 8″ square dish. These are the perfect size for portion control! They look amazing, and I bet they smell wonderful as they bake. Can’t wait to give them a try. Maddie — Thanks so much for the tip! Michele — Wonderful! I hope you love it! Kimberly — Yes! Portion control is key for me when it comes to apple crisp. 😉 Thank you! You say things like “cream cheese” and “apple crisp” in the same sentence, and my tastebuds start going berzerk. Seriously loving these single-serve delights! 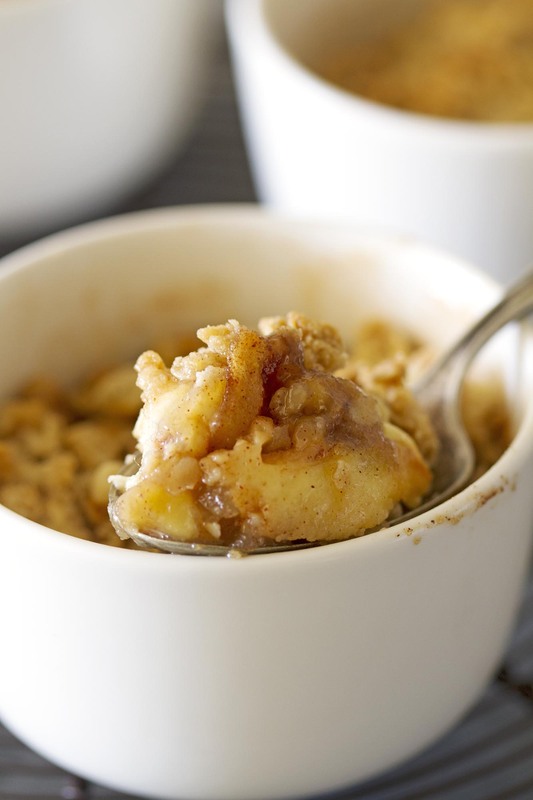 These apple crisps look absolutely perfect! Yum!